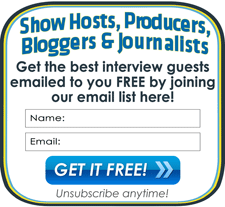 Our free directory of interview guests is designed to help anyone looking for guest experts. We help radio show hosts, podcast producers, bloggers, reporters, TV shows, academic researchers – anyone who is looking for credible opinions from expert sources. Please browse our 50+ categories of experts to find authors, celebrities, and experts of all kinds who are available for your interviews. How do I use InterviewGuestsDirectory.com? Browse the 50+ categories of expert listings here in our directory of interview guests. Subscribe to our free emails here to get notifications of the latest expert listings sent directly to your email inbox. After you have done that, you might also want to visit our sister site, RadioGuestList.com, to submit a free “Guest Request”. That free service will post and publicize your request for specific types of guest experts to interview, too. List your expert credentials with us here. After you have done that, you might also want to visit our sister site, RadioGuestList.com, to subscribe to its free “Guest Request” emails here or advertise there as a Featured Guest Expert, too. I don't see the topic or category of experts I'm seeking. What do I do? Think broadly. Talk show hosts, bloggers, and journalists might not know that they're looking for your specific expertise, so pick something close. Suggest a new category. We're always looking for ways to improve, so leave us a comment or send an email via our Suggestions Page here. InterviewGuestsDirectory.com is brought to you by the same friendly folks who started the popular radio and podcast interview booking service, RadioGuestList.com, back in 2008. Over the years of growth we’ve had with RadioGuestList.com, we received LOTS of requests from experts and authors to list their credentials with us online. By offering a centralized, low cost guest experts directory listing service here to these experts, we now make them easier to find for our friends in the radio, podcast, TV, blogging, and print media who need quick, easy access to top experts in a variety of fields. No, but we are close. Our mission is to help smaller voices get the publicity they deserve by making it easy for them to be found by the media. The site is run on a low cost basis and we give back to charity as much as we can. What a great question! We’d very much appreciate it if you support our advertisers, if you would book our experts for interviews, and advertise with us yourself if you are an expert or PR firm. Details on our several very cool (and affordable) advertising and sponsorship packages are here. Where can I log in to edit my listing? Sorry, you can't. The directory is centrally administrated by us so you have no "account" and there is no login. If you need to make changes to your listing, please email us. Small changes like typos or phone numbers are free. Rewrites or restructuring of your profile incur an editing and production fee. How can I cancel my listing? It's easy. Details are here. Please post your suggestions, partnership proposals, or feedback as a comment below. Or you can contact us via email at pr @ interviewguestsdirectory.com any time.